Dorothy Scott is recognised internationally for the excellence of her work in the area of child and family welfare. Over her long career she has made outstanding contributions to the scholarship and practice of social work and ensured significant advancements in social justice in the fields of mental health and child protection. She is a widely recognised senior scholar with a long and distinguished history at the University of Melbourne as a student, staff member and Honorary Professorial Fellow, whose advice continues to be widely sought. The author of five books and many refereed articles, Dorothy Scott has been influential nationally and internationally in improving approaches to preventing and responding to child abuse and neglect. She developed the first sexual assault counselling service in Victoria in the 1970s, has conducted several child protection inquiries and provided valuable advice to State and Commonwealth Governments. Dorothy Scott played an important role on the Protecting Victoria’s Vulnerable Children Inquiry panel, commissioned in January 2011. Tasked with investigating systemic problems in Victoria’s child protection system, and making recommendations to strengthen and improve the protection and support of vulnerable young Victorians, the panel’s ensuing report, now accepted by government, is seen as a strategic blueprint supporting a future vision for child welfare in Victoria. In 2005 Dorothy Scott was appointed Foundation Chair of Child Protection at the University of South Australia, and inaugural Director of the Australian Centre for Child Protection. Although she retired from these roles in 2010, she remained active through 2012, supporting the Centre until a new permanent appointment could be made. For her service to the community, Dorothy Scott has received both the Medal of the Order of Australia and the Centenary Medal. She is deeply knowledgeable about, and connected to, local and national philanthropic networks. She sits on international editorial committees, is national patron for the Centre for Excellence in Child and Family Welfare, the Victorian peak body, and for the Australian Foster Care Association, and sits on a number of Boards, including the Parenting Research Centre and Myer Foundation. Child welfare scholars the world over are quick to sing in praise of Dorothy Scott: ‘When someone in North America is asked to name an Australian child welfare scholar, Dorothy Scott is likely to be the first person named’ (Aron Schlonsky, University of Toronto), and ‘Professor Scott is internationally recognised for her ground-breaking work on community based family support practices with vulnerable families’ (Karen Healy, University of Queensland). 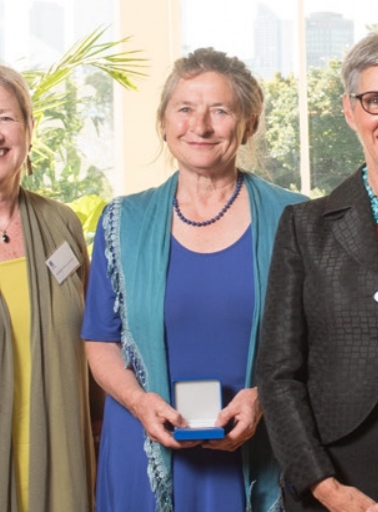 In recognition of her scholastic and professional leadership in child and family welfare and mental health Professor Dorothy Scott OAM is an exemplary candidate for the award of an inaugural Hyslop Medal.